What could a Church Learn from Savile Row? 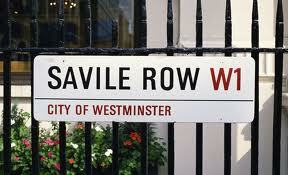 When I was in London last year, I made a visit to Savile Row. This is the famous street where the best and oldest fine bespoke suit tailors are. Shops like Anderson & Shepherd, and Henry Poole & Co. have tailored quality suits for gentleman for over a century. Their books reveal customers that include Winston Churchill, Prince Charles, Cary Grant & even Napoleon. And yes, James Bond also gets his suits from Savile Row. Though my budget does not quite stretch to tailored suits, I do appreciate the idea of buying a couple of quality, traditionally cut suits which last a lifetime or more, rather than several modern suits. The personal cut, quality wool, traditional style, and skilful craftmanship I find an appealing & dignified approach to clothing, in contrast to mass produced short term fashion-driven production. And I love the personal relationship built with customers over generations, the confidentiality, the attention to quality, the attitude of service in tailoring – which is not highly paid – craftsmanship, and even the humble approach to branding (which are sewn into the inside pocket). They’re all hand made on location from natural fibres, a model of eco-friendly, organic, local trade. They’re certainly expensive (starting at around $3000) but when observing one young man showing us how he wears his fathers and grandfathers suits made from the same tailor since the 1920’s, it did made me think. The traditional cut and quality wool means they don’t slavishly follow fashion, and so are never out of it, and literally last generations. This man was in a documentary I watched last week about the Savile Row tailors, and how they respond to an Abercrombie & Fitch trendy jeans mega-store moving into the street. It’s an interesting take on the battle between history, style, quality & local knowledge vs mass production and globalised branding. It would be just another ‘Shop Around the Corner’ scenario, except for the way in which the stores respond together. The previous competitors become collaborators, realising their common purpose. They take stock of their own best attributes and their strategy, not by either abandoning their history and following the new A&F store, nor by simply ignoring the new times and bunkering down in isolation – but rather by working together to jointly rethink, refresh and re-enliven their best qualities and ultimate purpose in the context of a new generation. The re-imagine their training too, for becoming a quality tailor takes years of personal training and mentoring, and it all happens in-house. They begin to collaborate in quality training to enhance quality new young tailors, and still insist on bespoke training for their context, for each store has a distinctive cut. They realise they have the best product in the world, and the way forward is not abandoning the unique & ‘orthodox’, but instead getting help in communicating that unique distinctive in a new world. They don’t retreat back, but rather begin to apply some of their quality approach from tailoring to communication, becoming more strategic & entrepreneurial in their own way, capitalising on their local knowledge, making a more well-known asset of their quality and bespoke approach. It’s interesting to see them find a new market in the US and China too, where mass products are everywhere, but an English bespoke quality tailor is a rare luxury. It’s the opposite of other fashion labels, which are mass-produced in Asia and shipped back. It’s also interesting to see the owner of A&F himself coming to get his suit at one of the other tailors, noting he personally respects and hungers for the quality of the traditional, the even as he is introducing the new, mass-produced product into the neighbourhood. What could a traditional church learn from the Savile Row Bespoke decision to welcome the new era by collaborating, re-imagining their best qualities & getting assistance to connect with a new generation, rather than either bunkering down in hidden tradition, or slavishly imitating a new mega-store? What could a new church learn from their longevity, quality and connection to the neighbourhood? What would it mean to take a bespoke approach to mission? What are the limits to this example?